A farmer in Liu Fendi village of Taipingdi town in what was a sandstorm-hit area, with shelter belts in the background. Credit: Manipadma Jena/IPS. CHIFENG, Inner Mongolia, China, Sep 11 2012 (IPS) - The setting sun is still streaming in through the poplars along the shelter belts, but Horquin Lianjun is done with farm work for the day. The desert wind has turned bone chilling. Lianjun’s half hectare of farmland sports neat spaced-out rows of maize crops, as in that of Hua Limei, his neighbouring farm owner, and most others on that stretch. “We earn around 400 yuans (63 dollars) from each harvested mu (15mu equals one hectare),” Limei tells IPS. In their forties, both farmers live with their families in Liu Fendi village of Taipingdi town in Chifeng region in the south-east of Inner Mongolia. An autonomous region for China’s Mongolian population, Inner Mongolia with its grasslands in its east and deserts in the west borders the Mongolian Republic and Russia to its north. It’s hard to believe that these farmlands and Taipingdi township were harsh sandy deserts just 60 years back. At that time, less than 66 hectares of forest were edged in by 4,500 sand dunes. Lianjun’s grandfather barely eked out a fourth of what he harvests today. Today deep forest belts shelter 10,000 hectares of Taipingdi farmland. Chifeng has an annual rainfall of 300 to 450 mm, with a disproportionate evaporation of 2,000 to 2,300 mm. In comparison, China’s average rainfall is 619 mm while coastal Shanghai gets 1144 mm. In the arid land, even regeneration of grass is difficult. While Taipingdi and other towns are fighting degradation, patches degraded by settled herders are turning into small deserts, forming oceans of sand. In the last nearly 50 years China has lost an area the size of Greenland to the desert, experts say. China’s ‘giant dust bowl’ is the largest loss of productive land to desert in the world. As the sand progressively degrades the farmland, growing poverty creates a vicious cycle. “The poorer the farmer, the more he’s desperate to get from the land. Consequently over-farming leads to worse degradation and he loses more than he gains,” 34-year old BaoYongxin, an activist farmer from Aohan county tells IPS in Chifeng city. 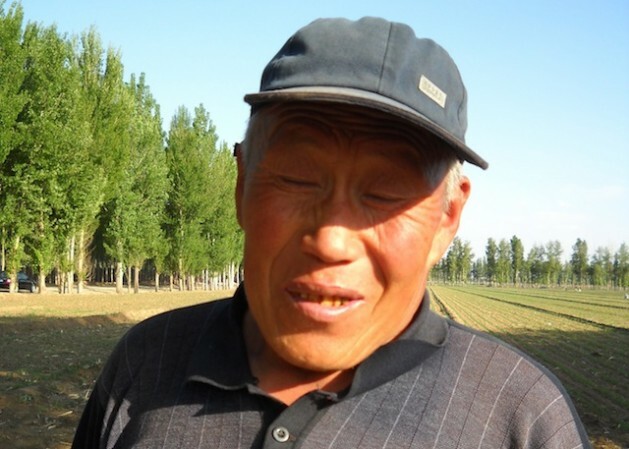 Yongxin’s mission is to promote plantations – the best fix against blowing sand that made life hell for him and his family. After marriage Yongxin and his wife did what they could to keep their farm from invading sands, but the turning point came in 1993 when on a stormy night his brother became seriously ill. “I walked him almost all night in the howling winds and battering sands – unable to see where we were going or how many hours we walked – to reach the nearest clinic,” Yongxin recounts. It was then that he decided to fight the encroaching deserts. He motivated Aohan’s embattled community to rejuvenate 600 hectares of their sand-ridden farms. But by 1998 Yongxin had exhausted all his savings in the unequal fight. The community approached the local forest department. A four-year project was worked out to reclaim 465 hectares of wasted farmland with the villagers providing the labour, and the department the technical support. At the forest department training centre they were told about various conversion methods: covering the shifting sands with a plastic net; chemical treatment to bind the surface sand; and containing sand mobility by regular interval fencing with shrubs, stone and straw. The Aohan community chose a combination of mechanical and biological measures to re-vegetate and reforest its land. The checker board method, after the dunes had been somewhat leveled by machine, was to draw three-feet squares that were then closely barricaded by 25 cm lengths of straw with half of their length secured into the sand. Such sand checks also helped stabilise the sand and to retain moisture. When drought-resistant species of Chinese and Mongolian pines, yellow willow and other shrub varieties were transplanted into the centre of each square at the onset of the monsoons, 75 percent survived. They were later watered by snow melts. “This technology has been widely used for over 20 years,” says Dong Haijun, forest section chief of Wengnuite county. By 2005, 2,400 hectares in Aohan had been recovered; 135 hectares of forest stood sentinel to rebuff the invading sand. The 120 homes in Aohan now had tiled roofs to keep out raging winds. In 2006 a highway came up to connect the village. The same year Yongxin became the village headman. In 2007, China’s Prime Minister Wen Jiabao honoured him as a “model combatant” against desertification. Farmers are compensated for lost farm income during conversion through cash subsidies and wages. Seedling subsidy and technical knowhow is provided for subsequent land use planning. The wild card, however, is climate change that farmers and herders blame for increasingly inhospitable weather. “Winters are longer and colder, the winds blow stronger and the summers are drier. Now, when the rains come, they are heavy and create flash floods,” Yongxin says.